Here is an amazing and entertaining magic act that runs a full five minutes, yet it leaves the audience wanting more. An ebook every magician should have. Chuck Smith's routine includes beautiful vanishes, appearances and color change transformations. It looks so incredible to the audience, yet the entire act relies on only two, easy-to-master sleights. 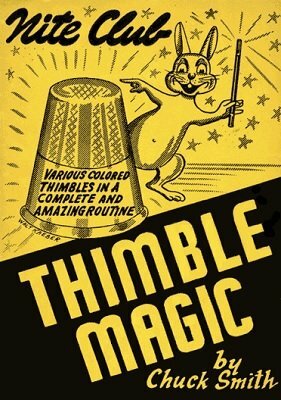 Everything can be examined (should the performer wish) before and after ... the thimbles really are ungimmicked. If you're an enterprising conjuror, use the corporate colors of your sponsor for the color changes for even more applause. Also includes three other effects, in addition to the main routine. 1950 Regow's edition. 21 pages.